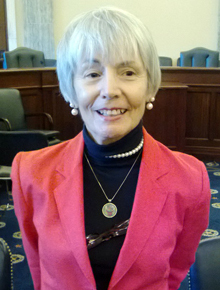 Last Tuesday, September 30, DBSA participant Trudy Lapin shared her story during two Congressional briefings sponsored by the Partnership for Part D Access. Trudy used her time to explain to Congressional staff from both the House and the Senate why a proposed regulation by CMS to restrict access to medication that aids in the treatment of mood disorders is misguided. You can read Trudy’s statement below, and learn how you can share your story with your own elected officials. Although I was first diagnosed officially with major depression in 1993, signs of that particular mood disorder appeared in childhood. While attending college, an over achieving pattern went into high gear. I elected a double major in French and English literature with a minor in secondary education. I graduated with highest honors; accepted a full fellowship to Yale Graduate School to pursue my doctorate in Romance Languages and Literatures; taught French language, literature, and film at Yale College and at the University of Chicago; and was awarded a National Endowment for the Humanities grant, where I enjoyed the privilege of working with humanities scholars at Princeton University. In spite of all this achievement, a move to Orange County, CA proved to be a difficult time for me. I could not sleep, eat, laugh, cry, let alone achieve anything. So, at the age of 45, I was diagnosed with major depression and given trazodone. After a few months in my system, I found myself asleep at the wheel in broad daylight. My car was totaled, but I somehow managed to wake up seconds before the car crashed into the 7th Street abutment on the Golden State Freeway. Two psychiatrists later I was still taking the same trazodone, despite my complaints of feeling over-drugged and sleepy most of the day. After 10 years of misdiagnosis, ineffective treatment, and one hospitalization, I prayed for help, and I got it. A nurse referred me to a female psychiatrist who prescribed 2 of the 3 medications that addressed my depression. It wasn’t until 7 years later, though, that I found the psychiatrist who has prescribed the most effective formulary that addresses my bipolar II rediagnosis. I travel 86 miles round trip to visit this doctor every 4-6 months, for I will go to any lengths to help myself. If you remember nothing else, remember this: There is lots of trial and error in the process of finding the correct formulary of medications to manage an individual’s mood disorder. One size does not fit all. We are all “guinea pigs” in the process, but here’s where faith comes in. Medications establish the physiological basis for recovery, but every patient needs emotional, social, and spiritual support to live a balanced healthy life. This is work! To remove the foundation of recovery—whether it’s electroconvulsive shock therapy and/or a host of medications which may often change during the lifetime of the patient – is the equivalent of going back to the Dark Ages or killing the patient slowly. I almost did this to myself when I threw away my depression medications, thinking that my only problem was my ex-husband who “drove me crazy”. This 6-month period qualified, I later learned, as my hypomanic episode, when I threw all caution to the winds and took insane risks with my health and my employment. I was put on job probation. If I had lost that job 2 years earlier than I did, I would not have been given a severance package and would have lost my house and possibly all hope for recovery in the process. When you take leave of your meds, it means taking leave of your senses. Why would I ever again – or any other agency, for that matter, allow that to happen? God forbid! Now, I have much to be grateful for. I have a loving husband, and although retired, I teach an occasional course. I have taken clinical pastoral training, and serve as On-Call Chaplain in the Intensive Care Unit. Therefore, I ask you, members of Congress to consider my story and the consequence of blocked access to medication for me and millions like me. During the many changes of my life, I’ve gained insight into the importance of self-care and speaking out for it. I’ve done all I can do to ask for your approval of medication’s role in the management of brain disorders. Now, it is up to you to do your best for you, your family, and your country. My story could be your story, your loved one’s story, your colleague’s story. We all deserve a fair shot at wellness. Thank you for your time and God bless. Now is the time to act. Let Congress know that we expect them to continue to respect the rights of individuals living with complex medical conditions by retaining their access to quality medical care. What lengths are you willing to go to protect current rights to quality mental health care through the Medicare Part D program? What are you doing to make sure individuals that utilize Medicare Part D are aware of the proposed CMS rule change? P.S. -- I forgot to mention that I first got SSDI back in 1997, and tried several, albeit short, FT work attempts throughout that time period, (*against wise medical advice), and ultimately went back on the SSDI rolls after crashing & burning, a little bit more with each optimistic, successful start leading to the inevitable overwhelmed, severely stressed out, not sleeping vicious cycle that turns into complete shutdown mode, and subsequently, worsening depression and self-criticism as being a failure. Trudy, thank you for your powerful story and for going to DC to help so many others. I plan to read it again!